We invite you to come visit us in scenic Finger Lakes wine country. Our love of the water and nature led us to purchase our lakeside property in 1986. After camping on the property for several years we envisioned building a Seneca Lake vacation retreat to enjoy getaways with our large family, and with friends. Originally from Syracuse, we had resided in the Rochester, New York suburb of Webster for 27 years. In 1995 our dream was realized when we were able to build our original lake house – a three bedroom, cedar contemporary home. We spent more and more time at Seneca and grew in our appreciation and excitement for the entire Finger Lakes Region, and the beautiful Seneca Lake/Dundee, NY area in particular. We began envisioning our property as a permanent residence and remembering our many wonderful bed and breakfast experiences in the past, the idea was born. We began discussing expanding our lake house so we could make it our full time residence and offer accommodations and hospitality to a wider circle. Our move to Seneca Lake coincided with our expansion project in the summer of 2003, doubling the size of our lake home. The original Bed and Breakfast offered three suites, including one apartment suite. We completed a second apartment suite in 2012. After many requests, we are now able to offer a short term rental option in the two large apartments – both of which have ample space, beautiful lake views, fully equipped kitchens, and private patios. This enables guests who prefer to prepare their own breakfast to be able to enjoy the luxury of these apartments at a much reduced rate. The savings is even greater because the rental option is taxed at 4% instead of the 12% that must be charged for the B&B. Sunrise Landing continues to be a labor of love for us. The open and casual interior has grown out of our desire to retain the comfortable, relaxed atmosphere of our original vacation home in its beautiful, natural setting. Nestled in the woods, on a hillside, with glistening Seneca Lake beckoning on our eastern front, and our courtyard and garden on the hill to the west, nature’s bounty surrounds us. Guests often ask about our family, what led us to inn keeping and what we did before. We raised a family of five children, all of which are now married and have children of their own. We have twelve wonderful grandchildren. 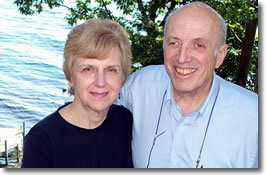 Barbara worked for years as a clinical social worker, and Bob has a design/engineering background. He has worked for years in sales. He co-owns a business in Rochester, Triline Automation Corporation, with one of our sons and works there a couple of days a week. Barb loves to cook and both of us have always enjoyed sharing our home with others and especially our beautiful surroundings on Seneca Lake. Each year hundreds of new guests discover Sunrise Landing, joining our returning guests, many of whom have been coming for years. We invite you to come and enjoy all Sunrise Landing Bed and Breakfast has to offer.